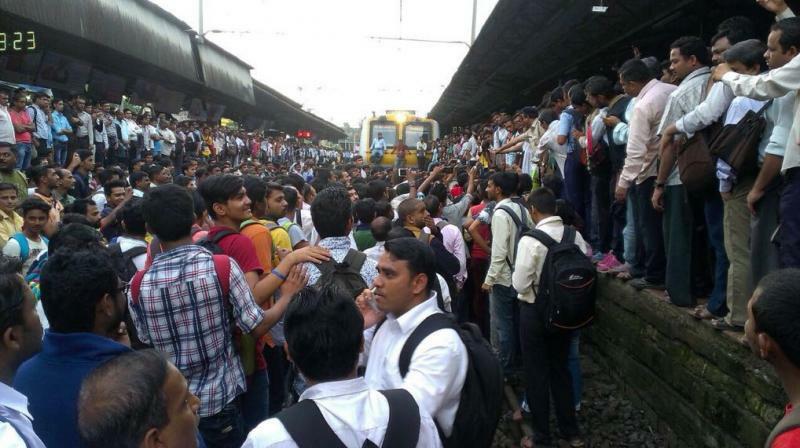 Mumbai local train services hit as Angery commuters protest at Badlapur station : On Friday morning, Suburban rail services were disrupted after angry commuters protesting over the train delay blocked tracks at Badlapur station in neighbouring Thane district, Maharashtra. Early in the morning, The irate commuters started protesting after a level-crossing gate signal caused a delay by over 20 minutes in suburban services rail of Central Railway. The angry commuters barged into the office of the station master. They demanded immediate action to resolve the issue. Later, the angry commuters jumped on rail tracks at Badlapur Railway station, stop the trains on the Central Line, which runs between khopoli and Chhatrapati Shivaji Terminus. The Central Railway spokesperson said that The local train Karjat-CST was late by 20 minutes due to level-crossing gate signal. At Badlapur, Commuters stopped the CST-bound Karjat local and Karjat-bound Thane local from 0555 hr. The protest also led to bunching of trains, which made a long queue on tracks on the suburban route. The security personnel calmed down the agitated passengers at the railway station and brought the situation under control. Following the protest, Railway Minister Suresh Prabhu directed senior railway officers to look into the matter and also appealed to passengers not to agitate. Railway Minister Suresh Prabhu tweeted that early morning, GM, DRM, Officers directed to help passengers in #Badlapur, sort out their problems. Requesting all not to agitate, all steps taken. The incident resulted in disruption of trains and local services were running late by about half-an-hour. A few Express trains of Central Railway were also diverted and rescheduled. A statement issued by CR officer said that the 11301 CST-KSR Bengaluru Udyan Express scheduled to depart at 0805 hrs on Friday, has been rescheduled at 1420 hrs due to public agitation at Badlapur.